Location: Carmel, NY. Putnam County. Terrain/Surface: Rolling hills, hard-packed dirt singletrack. Technically challenging with roots, rock gardens, boulders, log piles, steep ascents and descents. Technical Difficulty: Fire Roads easier. Mostly Intermediate to Advanced Singletrack. Trail Use: Mountain biking, hiking, horseback riding. Caution: Hunting in season. Obey DEP or No Tresspassing signs. From Carmel, NY (junction of Rt 52 and 301), take Rt 301 for about 1 mile west, across causeway, to Gipsy Trail Road (right turn, possibly unmarked). There should be a sign for Putnam County Park. Pass the Putnam County park entrance. Look for parking lot with NYS DEP signboard on right. From Taconic State Parkway north, exit at Rt.301. Turn right onto Rt.301 and travel east along the West Branch Reservoir. Before reaching causeway turn left onto Gypsy Trail Rd. and see directions above. Parking is available only in marked parking areas. 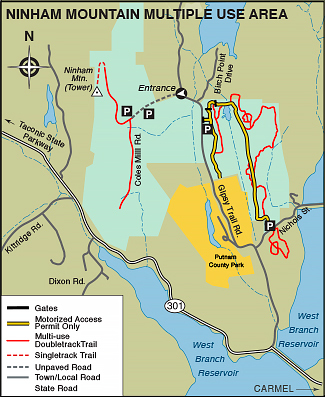 The 1,023 acre parcel of State Land, Ninham Multiple Use Area is the largest multiple use area in Putnam County and a hidden gem and a popular mountain biking venue in NY State. It contains numerous ridges with steep slopes and rolling plateaus. The predominant habitat is mixed hardwood forest interspersed with overgrown fields and marshy areas. Several Pine plantations are also present. The area thrives with wildlife and is home to a variety of upland wildlife including grouse, squirrel, rabbit, woodcock and deer. MTB Access to Ninham is SERIOUSLY threatened because trails, especially those located on the East Side of Ninham lead into adjacent private property or NYC watershed property (DEP). The DEC has sent recent warnings that many trails will be signed as CLOSED and that DEC patrols will be ramped up due to recent unauthorized trail construction. All you have to do to avoid trouble, huge fines or even having your bike confiscated is to respect NO TRESSPASSING, CLOSED or NYC watershed (DEP) signs and road closures. Obtain permits or other authorization as required. There are few beautiful open spaces for public access left in Putnam County. It would be a shame to lose it. The Ninham Multiple Use area is bisected by the Gypsy Trail Road, off Route 301. To the west, two north-south main dirt fire roads begin from the parking area. The fire roads pass through old fields, deciduous woods, and by a small pond. Head either north or south on the fire roads and return the way you came for an easier ride. A few of the trails near the parking area are suitable for intermediate and beginner mountain bikers. However, most of singletrack side spurs are technically challenging and geared for the more experienced intermediate and advanced rider who enjoy lots of rocks, roots, and elevation. If you are in the mood for a climb and a challenge (no pain, no gain), try the well groomed dirt fire road that leads to the Ninham fire tower atop what is locally known as Smalley Mtn. It's a gradual but steady incline and will give you a good workout. A one and a half mile singletrack traverses a ridge near the summit. While the view at the top is beautiful any time, it is spectacular in the fall. There is ample room at the top to spread out and relax. A picnic with a view is a good way to reward yourself. Built in the 1930s by the Civilian Conservation Corps, the tower is listed in the National Historic Lookout Register, and deemed not safe to climb. It is in the process of being renovated. The return descent down the mountain is icing on the cake.